My day-to-day battle with a chronic pain condition known as Complex Regional Pain Syndrome. I had a bad day yesterday, my pain got so bad that I blacked out at the top of the stairs. I woke up at the bottom with lots of blood coming from my head, a completely swollen Crps arm, a suspected broken hip, neck injuries & a suspected dislocated shoulder. I had to stay there for 1 1/2 hours until my carer called before she could call an ambulance. I was taken to our regional trauma centre in record time & was amazed how many docs & nurses were waiting for me as I was wheeled in. They were amazing & to my surprise, knew exactly what Crps was & treated me accordingly. My Crps is down my right hand side so when I got there a ward sister stood next to my bad arm & said that her sole aim was to keep my arm safe & make sure nobody touched it. She was amazing & I was so impressed with them. Luckily my hip was ok & my shoulder popped back in before we got to hosp but my arm is a mess. My neck survived apart from damaging a nerve that sent my bladder into retention which meant I needed a catheter for a while but I'm very lucky. This all happened because my pain got too much. People need to know just how much we suffer & if there is anything they can do to help. For instance, when I got to the ER, they used warm blankets so not to shock my damaged side & create more pain. How can I silence the pain in my head? It's been nearly 4 months since my last post & during that time my quality of life has continued to get worse as my pain has got stronger. I've become very unsteady on my feet recently, especially on the stairs & this has led to a few nasty falls followed by trips to A&E, the worst of which left me with a dislocated shoulder & a fractured wrist. These falls all take place when my pain is at its strongest & there are usually certain times in the day when this can happen. This is linked to what time I take my pain killers & if I have been moving my bad arm more than I should. My doctor asked me to explain to him what I think is making me fall because "pain doesn't push you down the stairs". I'm now going to try to explain it to you the same way that I explained it to him because whilst I was telling him, it suddenly started to make more sense to myself. My pain seems to come in 3 different strengths. When I am having what I would call a 'good day' my pain score will be about 6/10, when I'm having a 'bad day' my pain will be around 7.5/10 & when I'm having a 'very bad day', which is happening a couple of times a week at the moment, my pain is at at 9/10. I don't really find these numbers very helpful because 7/10 for somebody with a chronic, long term pain condition will probably be far stronger than it would for a normal, healthy person with a normal pain threshold. Because of this, I wanted to find an easier to understand way of describing my pain which could also be linked to my falls so here goes. On a 'good day' he is just saying "PAIN" in a normal voice taking up about 1/3 of my brain power but I can try to overcome this by using the rest of my brain to keep me busy & concentrate on other things as well as using my spinal cord stimulator to try to mask some of the pain which is still left. On a 'bad day' the pain is shouting in my head which uses up about 70% of my brain capacity. This doesn't leave much brain left to focus on anything else & my stimulator hasn't got enough power to overcome the pain at all. Because I can't focus on anything else, the pain stays strong but my concentration & balance weaken. It is at this point that I become more susceptible to tripping & falling, especially on the stairs. Finally, on a 'very bad day' the pain is shouting & screaming in my head as loud as it can as well as using my brain like a bouncy castle, jumping & crashing around inside my head. On days like this my stimulator makes no difference at all & I only have about 10% of my brain power left. This is enough to keep me from seriously endangering myself but other than that, I will be either unconscious or walking around in a 'pain induced daze' unable to communicate properly or complete the most basic of tasks such as get dressed or eat my lunch. This is when most of my accidents occur. After explaining the above to my doctors, they tell me that what I'm experiencing is very much like having mini strokes or TIA's & it's my brain's way of coping with the pain without causing any permanent damage. On one hand it is a relief to know that my brain isn't getting any more damaged but on the other hand, it means that until a 'cure' for CRPS can be found, I may live with this pain for another 40 years which I really don't think that I'll be able to manage. If anybody else is experiencing anything like myself then please let me know because at the moment I feel like nobody else can understand what is happening to me & this makes me incredibly lonely. It also takes up an awful lot of my thoughts during the day. Why is it that Chronic pain takes over every part of my life? It feels like I have no privacy from my pain, I cant hide anything away from it. There's just no escape! I can't plan a day out with the family & pretend that the pain isn't there because it always rears it's ugly head at the worst possible time. Just when my boys want me to go for a paddle in the sea or take them for a ride on the dodgem cars. Planning to go for a swim at our local swimming pool becomes a lottery with disaster looming around every corner. Even something as simple as going to church with my family on a Sunday morning becomes an epic struggle which more often than not ends in complete failure. These are the reasons why I feel that I am such a burden to my family & friends. Why did I have a stroke at 38? I was 38yrs old when I suffered my first 'stroke'. I was in the middle of a very harsh CRPS flare up with my pain score rarely dropping below 9/10. I remember going to bed around lunchtime with a severe headache on the left side of my head. I telephoned Kirsty at work to tell her that my right leg & arm had gone very heavy but found that I was slurring my words whilst trying to tell her & some words, although I knew what I wanted to say, just wouldn't come out. Not long after my phone call, my mum arrived to check on me as Kirsty had told her that she was worried about me. As soon as my mum asked me how I was, she could see that something was wrong & immediately phoned my GP who said she would come to see me as soon as she started her emergency house calls. By this time I was starting to worry about the prospect that I was having a stroke due to seeing it first hand with my grandad for many years before he passed away. I could see my mum was thinking the same thing so she contacted Kirsty again & told her to come straight home. She arrived just as my GP was telephoning the emergency services to arrange an ambulance to take me to the the acute admissions at our nearest hospital. After arriving at the hospital we bypassed the ER dept because my GP had phoned ahead & organised a bed on the Acute Admissions ward fearing that I had indeed suffered a stroke as by then I had lost all my speech & my ability to swallow as well as being paralysed down my right hand side but this information seemed to have been lost on the way. I was put in a bed & was told that a doctor would be along to examine me as soon as one became available. I was soon joined by my wife, my mum & my two sisters. Little did we know just how long we would have to wait until we got to see that doctor. It was about 9pm before I was examined by a junior doctor despite my family pointing out to staff that it had been about 6hrs since I was last able to drink some water & then it still took a further hour before he decided to put me on a drip. By this time, it had been 10hrs since I last took my pain killing meds for my CRPS which meant that I was in absolute agony but was not able to tell anybody due to the problems with my speech. Eventually Kirsty figured out what I was trying to tell them but, as I have found regulary over the years, the doctor had no idea what CRPS was so told one of the nurses to give me paracetamol injection which made no difference whatsoever.This was the start of my CRPS nightmare. It was 2am when I was given a CT scan which the doctor said had shown that I had suffered a severe stroke & transferred onto the specialist stroke ward. The staff were fantastic & very caring but had never come across a CRPS patient before, never mind one that couldn't talk to explain his condition. This meant that every time a nurse came to my bedside & held my hand or took my pulse, they were unknowingly, putting me through immense pain which I couldn't tell them about. My speech problem also meant that it took over 4 days before my pain medication was reinstated but due to my inability to swallow, I was given it via a nasal gastric tube which was not pleasant. Eventually, Kirsty placed a poster over my bed warning staff not to touch my CRPS affected arm & explaining a little about my condition. It was ten days after my 'stroke' that I was told by my consultant that he had looked again at my scan results & concluded that I had infact NOT had a stroke at all. He said he had no idea what it was but the symptoms were the same as a stroke so my rehab plan would be just the same as a stroke patient. When my family asked him what investigations he would be carrying out in order to find what had caused my condition, he told them that he would treat the symptoms but would not be doing any more tests as he was not too interested in what caused them. It was left to my wife & sister to finally discover that it was not uncommon for some CRPS sufferers to suffer from stroke like symptoms which were somehow linked to the amount of pain the brain was having to contend with at that moment in time. Personally. I think it was the brain's way of saying "I can't cope with this amount of pain" & shutting itself off. Just like my computer does every time it gets too hot. I then have to wait for it to cool down before it will reboot itself. This is just like what happened to my brain but the reboot took a total of 9 weeks before I was allowed home. My rehab was a long & gruelling journey, made worse by the fact that my physiotherapists had to set an exclusion zone around my CRPS arm which was also the arm that was affected by the stroke. Because of this, my arm is still pretty useless due to the total lack of physio & will never really regain all the movement that I lost. It took me 9 weeks before I was able to walk & climb a few stairs with the help of a walking stick but now, two years later, I still need the assistance of a carer who comes every morning to help me out of bed, take a shower & make my breakfast & lunch. We are in the process of trying to find the money to build a wet room & toilet downstairs to give me a little bit more independence as, at the moment, I am stuck upstairs all day long because I'm not confident or strong enough to go up & down stairs every time I need to use the loo when I'm in the house on my own. It's now two years on & I'm still suffering from mini strokes/pain seizures every couple of weeks. The docs are still saying that they are caused by my pain which means the only way they can prevent them would be to reduce it. This looks further away than ever & each time I feel a stroke starting, I wonder will it be a mini one which will take a week to recover from, or is it another severe one which will land me back on the stroke ward if not worse. CRPS really does affect every part of your life. It's already destroyed mine & is well on the way to destroying my wife's life as well. The question is how do I prevent it from destroying my children's lives. Sometimes I feel that they would all be better off without me but then other times I think that having me like I am is still better than not having me at all. I just hope my children don't grow up hating me rather than just hating my illness. I thought it was about time I shared my experiences of dealing with the so called 'deadly MRSA bug' so here goes.. When I was told I had MRSA, I had already had an infection in the wound on my neck from the 1st surgery to fit my Spinal Cord Stimulator. That led to 8wks on a drip of antibiotics but when that didn't work, they removed the stimulator. They kept me in hospital for another 2 months whilst my neck healed then decided to put the scs back in again. It was at this point that I contracted MRSA. It didn't really feel too bad to me except my side swelled up like a football because the battery pack was completely covered by the bug. It all happened very quickly because I was in theatre within 3 hrs of being diagnosed, this was important because it had already eaten into the surrounding of my spinal cord which has left my right leg a lot weaker than my left. If it had took much longer, I would have been paralysed. After the op, I was in my own room for a further 11 months with no exercise, the MRSA also damaged my pituitary gland so I can no longer produce human growth hormones or testosterone. This also effects your weight so combined with the lack of exercise, I've gained over 70 lbs in weight which I hate nearly as much as the pain. I still think that MRSA is worse for your family than yourself cos I didn't really know what was going on until I was back in intensive care after the operation with the hardest part over. over the yrs my wife Kirsty has had to revive me after I bit thru my tongue following a seizure & she has had to call the paramedics no less than 6 times. She deserves a medal. I've just realised that it's 14yrs ago today that I broke my arm playing football for oxten athletic in the Wirral Sunday league. I slipped over as somebody was about to kick the ball and they made contact with my wrist instead. Why do I remember this incident so vividly you may ask. I remember it cos when I went to the hospital and found out that it was indeed broken, it was put in a plaster cast that was too tight and despite me telling the doctors that it was very painful over the next 4 weeks, when they removed the cast they were surprised to see that it had swelled inwards & destroyed the nerves in my wrist and left me with a condition called CRPS & the rest is history as they say. (CRPS otherwise known as Complex Regional Pain Syndrome is a complicated brain condition which google & you tube explain much better than I do). My day to day life now consists of my wife Kirsty going to work at 7.30am and taking the 3 boys with her and dropping them off at daycare & a school friends. My carer comes in at 9.30am to help me out of bed, showered and dressed & makes my breakfast then back to bed. My lunch is sandwiches that either Kirsty has left for me or the carer has made then I am on my own until, Ewan 11, makes his own way home from school at 4pm. A couple of days a week the twins, Rowan & Finley 3 arrive home from nursery at 1pm and spend the afternoon with Paulette our lovely child minder who brings me a constant supply of tea and sympathy but I would seriously give my right arm (excuse the pun) to be able to make a cuppa for myself. So that's my life at the moment and I haven't even began to tell you about the 'stroke like symptoms' I have been left with as a rare side effect of the CRPS. Maybe that's another story for another time. 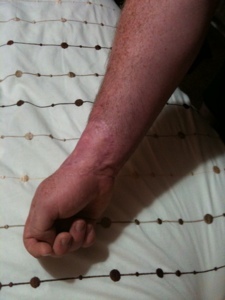 Retired from Halfords due to suffering from CRPS (Complex Regional Pain Syndrome). Retired mobile DJ, hung up my headphones 6yrs ago due to I'll health but stored all equipment away cos I couldn't part with my baby. :-((( Happy Days!! Copyright Ian J Munro. Picture Window theme. Powered by Blogger.